Muslim pupils are more liberal and tolerant than non-Muslim pupils, a Home Office-funded study has found. The research, involving 400 15-year-olds, was carried out by Lancaster University in a two-year project after the 2001 Burnley riots. It found that nearly a third of non-Muslim pupils thought one race was superior, compared to a tenth of teenagers in a mainly Muslim school. The report's authors said some of its conclusions were "cause for concern". It is the result of the first year of two years of research by the Department of Religious Studies at Lancaster University, to help work towards bringing communities together in Burnley. 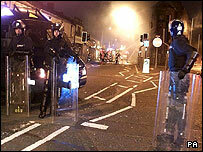 The town was the scene of race riots in 2001 which saw violent clashes between gangs of youths. Dr Andrew Holden, who carried out the research, said it had highlighted the fragility of the British identity. He spoke to pupils from three schools in Burnley and Blackburn. One had mainly white pupils (School A), one mainly Asian students (School B) and the third a mixture (School C). The survey found that 8% of pupils at school A and 12% in School C expressed an interest in finding out about other people's religious beliefs, compared to 42% at the mainly Asian school. Dr Holden said: "The greater degree of racial tolerance in an overwhelming Asian/Muslim populated school again calls into question the common sense assumption that mixed schools represent more tolerant environments." At School A, 29% of the pupils questioned were in favour of different faith communities working together to create a better society, compared to 76% at School B. The report concluded that Burnley was still a "largely" segregated borough, but that several projects put in place since 2001 in Burnley "have the potential to improve integration". Dr Holden said: "It is the cumulative effect of myths and stereotype, negative perceptions of cultural diversity and fundamental difference that teachers, [that] outreach works and educational support staff must make every effort to combat."